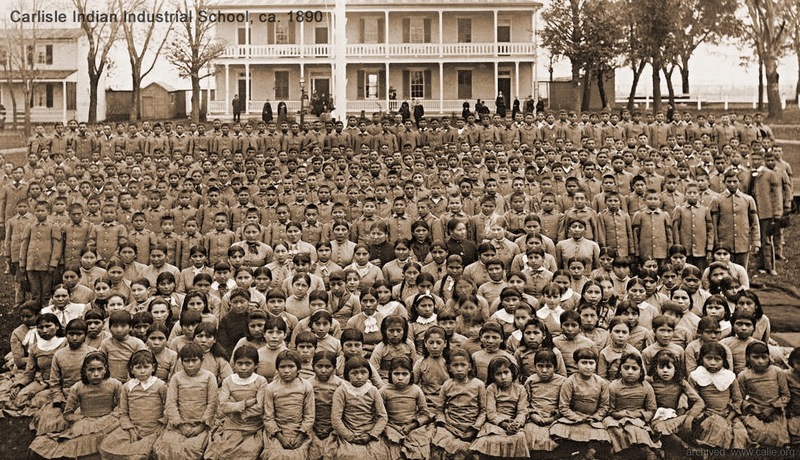 At the end of the ‘Indian Wars’ in the 19th century many Native American children were taken away from their parents and sent to school to become ‘civilized.’ The policy - ‘kill the Indian to save the child’ - meant cutting their hair, putting them in white people’s clothes, forbidding them to speak their own languages. When the First World War broke out in Europe American Indians were not citizens of the country they lived in (in fact, they were only granted US citizenship in 1924). Their languages were considered obsolete. 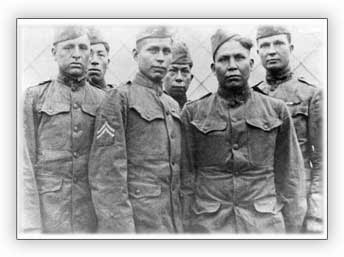 But then, in 1917, a group of 19 young Choctaw men arrived in Europe as part of the US Expeditionary Force. In compliance with memorandum, Headquarters 36th Division, January 21, 1919,to C.O. 142nd Infantry, the following account is submitted. In the first action of the 142nd Infantry at St. Etienne, it was recognized that of all the various methods of liaison the telephone presented the greatest possibilities. The field of rocket signals is restricted to a small number of agreed signals. The runner system is slow and hazardous. T.P.S. is always an uncertain quantity. It may work beautifully and again, it may be entirely worthless. The available means, therefore, for the rapid and full transmission of information are the radio, buzzer and telephone, and of these the telephone was by far the superior, - provided it could be used without let or hindrance, - provided straight to the point information could be given. It was well understood however, that the German was a past master of ‘listening in’ Moreover, from St. Etienne to the Aisne we had traveled through a county netted with German wire and cables. We established P.C.’s in dugouts and houses, but recently occupied by him. There was every reason to believe every decipherable message or word going over our wires also went to the enemy. A rumor was out that our Division had given false coordinates of our supply dump, and that in thirty minutes the enemy shells were falling o n the point. We felt sure the enemy knew too much. It was therefore necessary to code every message of importance and coding and decoding took valuable time. After the withdrawal of the regiment to Louppy-le-Petit, a number of Indians were detailed for training in transmitting messages over the telephone. The instruction was carried on by the Liaison Officer Lieutenant Black. It had been found that the Indian’s vocabulary of military terms was insufficient. The Indian for “Big Gun” was used to indicate artillery. “Little gun shoot fast”, was substituted for machine gun and the battalions were indicated by one, two and three grains of corn. It was found that the Indian tongues do not permit verbatim translation, but at the end of the short training period at Louppy-le-Petit, the results were very gratifying and it is believed, had the regiment gone back into the line, fine results would have been obtained. We were confident the possibilities of the telephone had been obtained without its hazards. Within 24 hours of the Choctaw's deployment the tide of the battle had turned and in less than 72 the Allies were on full attack. Victory soon followed. Thank you, Tanya. I did not know the use of Native American languages as military code happened as early as WWI. During WWII, the U.S. military used Navajo and Lakota (& other) Code Talkers against the Japanese in the Pacific. Again, the Native American codes were very effective. I had no idea that these languages were used as codes in either war, so thank you both Tanya and Debbie. Heart-breaking about the children, being ripped from their culture especially when you know that no matter what language they spoke they were never going to be accepted as equal citizens in those days. Thank you Tanya. Fascinating info! Do you have a definition for TPS? I looked it up and got bogged down in long lists of acronyms. Wow. I knew about the WWII codetalkers, but not WWI. (I also didn't know that Native Americans did not have US Citizenship. This is new to me too, fabulous in its implicit criticism of official policy, and the willingness of some peoples to give even when so much was taken from them. Thank you very much. Really interesting in so many ways. Thanks!